Sometimes, I struggle with gift ideas all the way to the last minute before I leave for camp. This year, however, most of my ideas seemed to fall into place quite easily, and rather than my usual late nights trying to get it all done in time, this year I finished the first project almost a whole month before camp. In AJ‘s answers, she mentioned that she was hoping to start a herb garden. 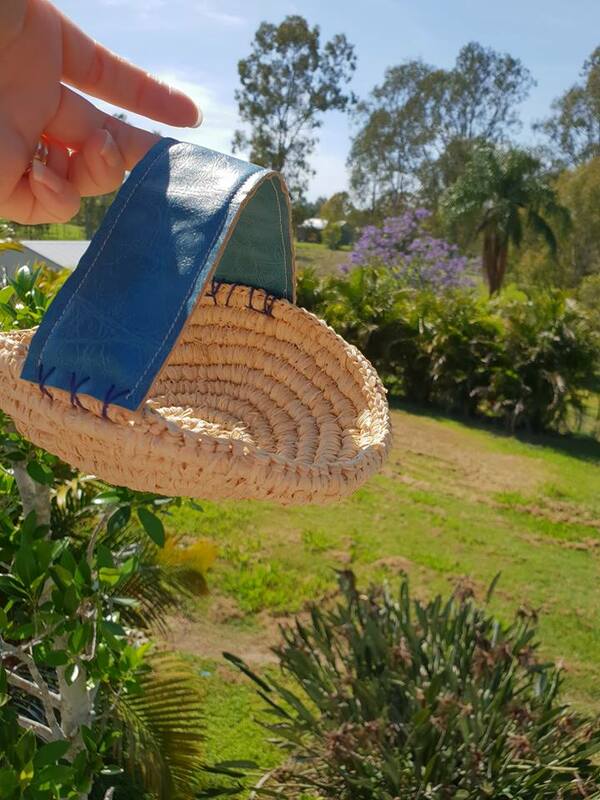 Straight away, I thought how cute a little herb harvesting basket would be, and next minute I had a 250g bundle of natural raffia heading my way. It took a bit longer to make than I thought as I kept needing to rest my hand – while it uses a motion similar to crochet (and indeed uses a crochet hook to work the raffia), the stiff fibres required much more effort to work than a nice soft blanket yarn, and it would become uncomfortable after too long of a session. Once it was about the size that felt small enough to be herb-suitable, but big enough to hold a decent haul for a good cook-up, I bound off the last of the raffia, and then used teal faux leather to create a handle, by top stitching two 2″ pieces together. I think in hindsight I would have been better to make the handle a wee bit thinner, for comfort, but I think over time and with use, the leather will flex and mold to AJ’s hand to create a comfortable and secure hold. The handle is secured to the basket with some hand stitched crosses in navy floss, with the leather having been prepierced with my bookbinding awl. This is project thirteen of 26 for the Make All The Things Challenge I am doing with Carrose Creative – I had planned on using raffia as a substitute for another material until I realised that raffia comes from the raffia palm, and thus could be counted as my PLANT project. You can see my other finished projects here.